Band on the Wall presents Free Vibes – a free-entry event showcasing some of the most exciting artists you need to know. 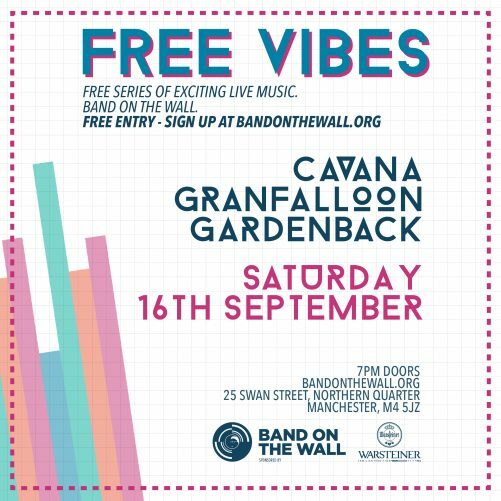 Sign up for free entry and discover new music from the likes of Cavana, Granfalloon and Gardenback. Cavana are a young four-piece indie rock band based in Manchester/Salford. Writing hard hitting melodic indie rock and perfectly combining both subtlety with raw aggression this four piece is one to keep an eye on. With aims of making a real noise – These boys are here to stay. Granfalloon is a Manchester-based composer of all things lo-fi, folk and psych. He performs with a band and tasting notes include but are not limited to Sufjan Stevens, Jane Weaver and Kurt Vile. A three-piece from Oldham, Gardenback create psychedelic influenced garage rock. With a noisy guitar, melodic bass and powerful drums, they reflect upon what they know best; ambition, frustration and ultimately disappointment.